Life as working parents can be busy and weekends are very precious. 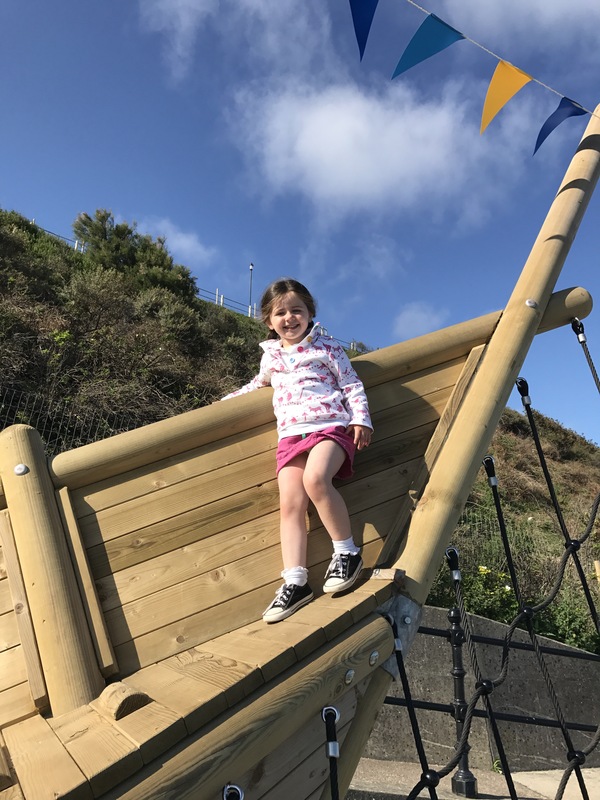 I guess as a Mum I tend to feel particularly guilty about going to work (although I do love what I do)….and probably over compensate at weekends when I try and plan lots of fun activities for us all to do together. When we received an adult only invite to a wedding in Norfolk I was excited at the thought of partying past 10pm (who wouldn’t be!) but slightly reticent to leave the children for the whole weekend (not I hasten to add because I’d have to leave them but because I wouldn’t get to spend time with them!). So I persuaded my parents to come with us (it didn’t take much!). This way we’d get to go to the wedding but get to spend some quality time as a family in a lovely part of the world. Win win situation. 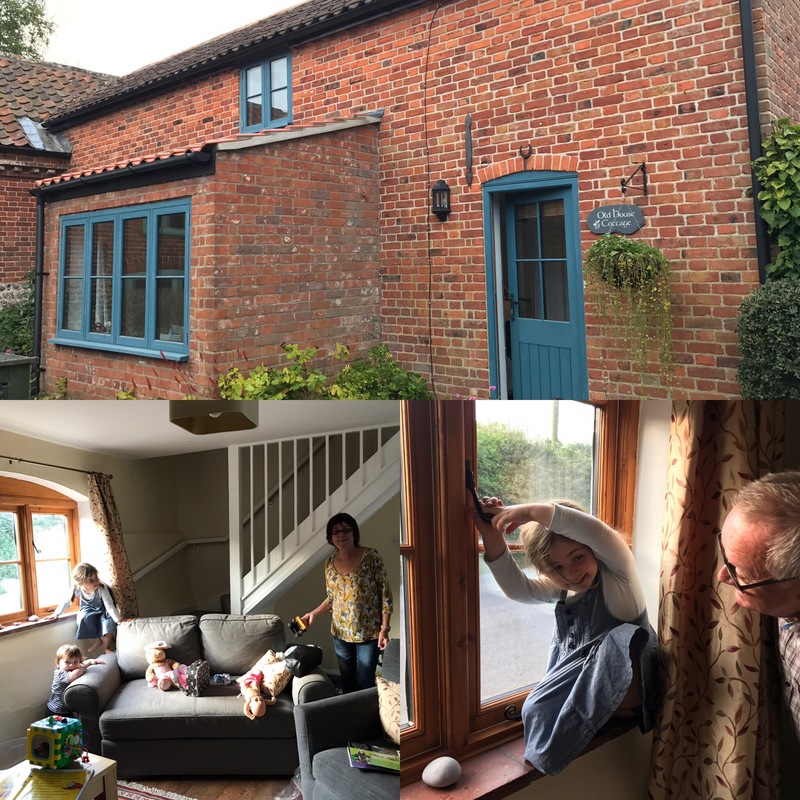 So we eventually booked a fab little Airbnb in Aylmerton. It was trickier than normal to find somewhere. Most places in Norfolk had a minimum stay of 7 nights! Anyway, this place was perfect – parking for two cars, 3 bedrooms and a double sofa bed in the living room (given that we would be stumbling back after the wedding we had the short straw!). The cottage was warm, cosy and very well equipped. There was a well stocked kitchen (and a nice bottle of wine waiting for us when we arrived…after a 3.5 hour drive with the children I certainly needed it!) and a beautiful clean bathroom. The bedding was high quality (I do like a good feather pillow) and the beds really comfy (yes even the sofa bed!). I was pleased we’d taken our blackout blinds….especially the morning after the wedding when they gave me (my husband can sleep through anything!) a few precious minutes to surface! Aylmerton is well placed for exploring all that north Norfolk has to offer. You’d easily have enough to do for a week with plenty of indoor and outdoor attractions nearby. We were only in the area for 2 nights…not nearly enough time to explore. Cromer was the nearest large town. It has a number of supermarkets. *Top Tip: Live like a local, book an apartment through, this link for £30 travel credit with Airbnb and we get a little something off our next booking too, enjoy! Conscious that we needed to get back to the cottage for a bite to eat before a wedding coach collected us at 12.15 we wanted to make the most of our time in Norfolk. Thankfully, travelling with young children means we’re up at 6am and dressed and fed by 8am. 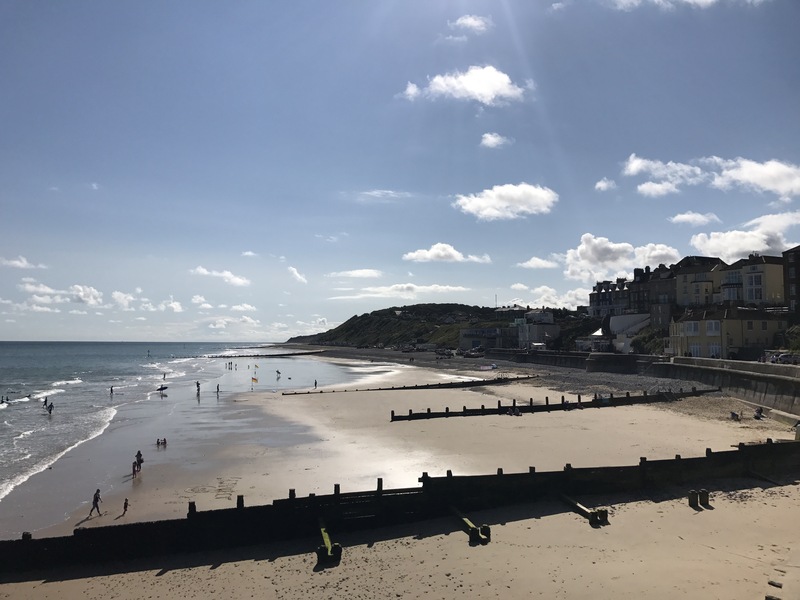 So after a morning snooze for our youngest we were in Cromer in time for a morning coffee (and ice cream!) at 10am. 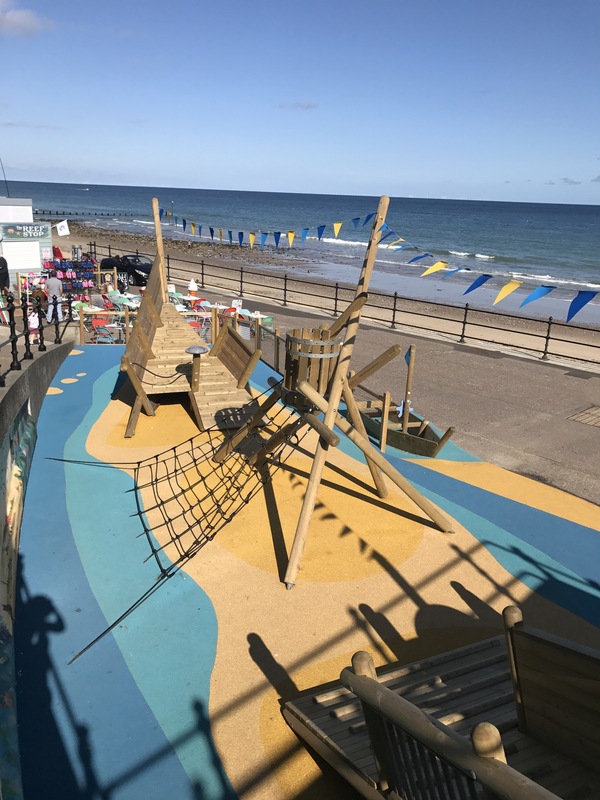 Parking in the main town carpark (at the junction between Runton Road and Beach Road) we stumbled across an epic pirate play park on the beach front – both of our little people loved it! The goats perched on the hillside were definitely an added bonus and the life boat at the end of the pier topped the morning off nicely. My parents returned in the afternoon once the little one had woken from his next snooze (oh to be a child!). They spent the afternoon soaking up the very welcome September sun and dodging a rapidly approaching tide! Meanwhile we partied the night away at Godwick Great Barn (at an epic wedding!) and miraculously managed to get our pre-booked taxi back from nearby Weyborne (a stunning little village by the way!). After a leisurely breakfast (thanks to Grandma!) we decided to spend the morning in Norfolk and planned to hit the road after lunch, in the hope that at least one child would sleep some of the way. 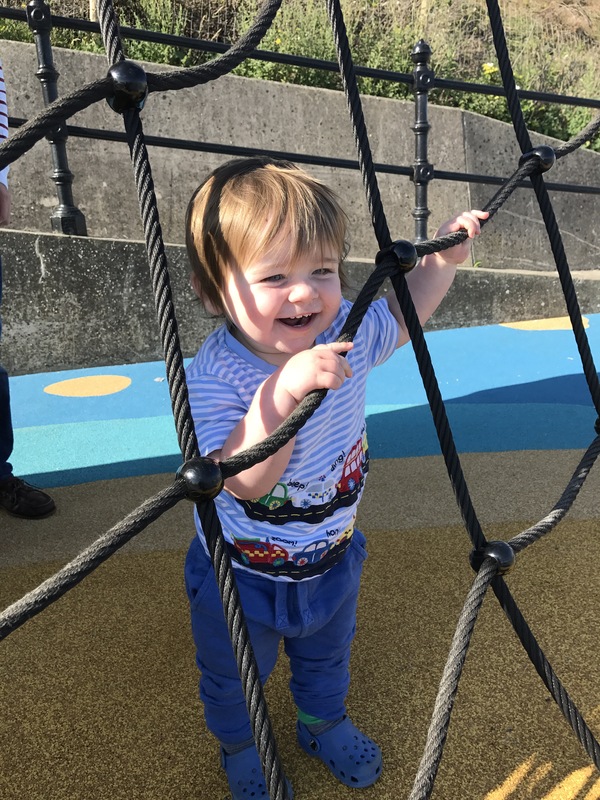 In fact both children were so exhausted by all the fresh air that they both slept for nearly 2hours – that’s what I call a result! So the morning was spent on the pebbly beach at Salthouse (no better way to cue a mild hangover!). It was deserted and the children loved running around, chasing waves and building pebble towers. We (or they!) managed to abscond with a fair number of said pebbles, hidden in my handbag (I thought my bag was heavy at work the following day!). 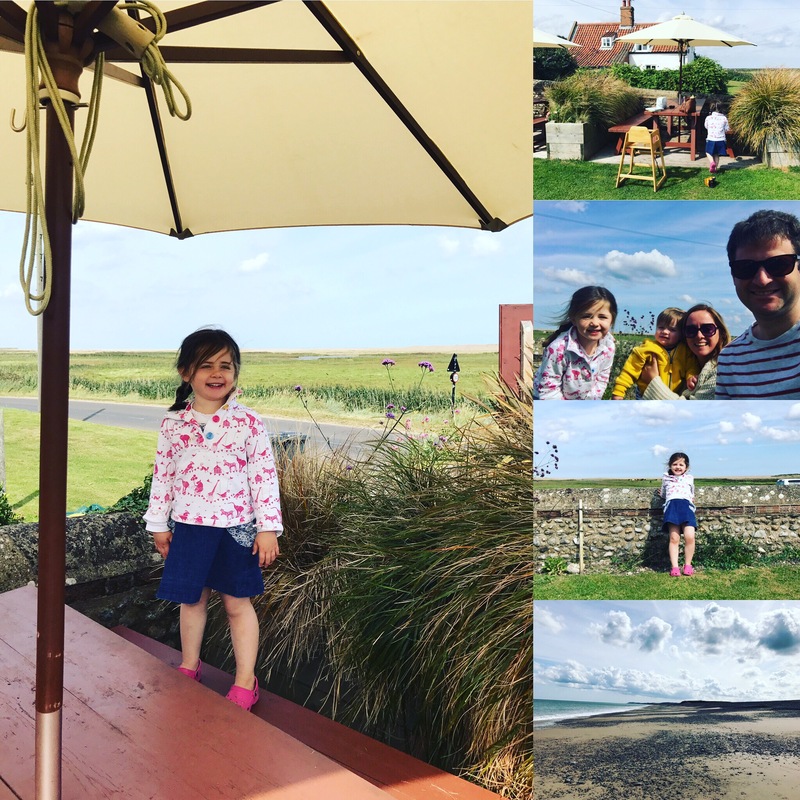 After a few hours of fresh air on the beach we drove the short distance to the Dun Cow pub in Salthouse. There was some parking on the village green but I imagine it get’s pretty busy during the peak summer months. The pub doesn’t take bookings so you may want to arrive early. Now, this summer hasn’t been the best but the weather was kind and we enjoyed a home cooked meal in the pub garden overlooking the sea (it doesn’t get better than this!). All in all a wonderful weekend and one that left us wanting to see much more of Norfolk. It is not only beautiful but packed full of fun family activities. Whilst it’s a long drive from our house in Alcester (Warwickshire) it was perfectly manageable, even for 2 nights. It’s remoteness is part of its charm, it feels off the beaten track and we like this sort of place. We’ll definitely return and for longer.